The phrase “spiritual goals” sounds strange to me. “Christian goals” also has an odd ring to it. Is it just me or does mixing these two words together like the corporate world mixed into the church? Our goal as Christians is to look to Christ for our salvation. Everything else just simply hangs off that amazing fact. While I strive to not sin (which is impossible to do), I find my identity in Christ more through what he did for us than I what I do. If I look at what I do, I see filthy rags. I see sin. Lots of sin. Lots of sin-encrusted rags. Perhaps that’s why I find the formal procedure of goal-setting a bit hard, almost impossible. Well, however you split the theological hairs, it’s still fun to give this document a try. The key thing is to not get too wrapped around the axel with this document being sanctification. It’s not sanctification (people may freely argue me on this point). These are just some things you can do in your life. I’d say if you don’t want to do any of these items, then don’t do them. If your heart is not in the place to set goals, then you have some praying to do to figure out why you are shying away from certain things. 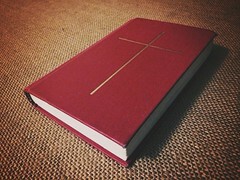 At home I have a great book from my childhood called the Lutheran Book of Prayer. A couple years ago I prayed from this book at home every morning before I left for work. Now I’m going to use this book at work. Hopefully it will set my mind in a better frame at the workplace. This is a good goal for me, because I’ve waited long enough to get married to my absolutely wonderful girlfriend. I’m finding that it’s very helpful to have friends encouraging me. Yes, it’s January 29, 2014 and I have yet to mail my Christmas cards from 2013. The cards are printed, I just need to pick up a gold pen to write on the inside of the cards. I complain too much at work. The best counter for complaining is giving thanks. For a short time last year I was keeping a log of what I learned every day at work. This is a different spin focusing on the positive. Learning can be positive, but sometimes I can focus on things I learned from negative experiences. In 2012 I was keeping a log of things that made me happy every day. This particular thankful log will be work-focused, hopefully it doesn’t end up being too repetitive. Yes, the goal isn’t three times a week. It’s not even once a week. It’s once every TWO weeks. The idea is that these goals need to be achievable. Hey, let’s be honest, in the last six months I’ve been to the gym ONCE. Twice a week should be more realistic for me. Besides, I tend to be the type of person who performs better when a lower goal is given to me. I will always totally over-perform an easy goal, because I feel encouraged and inspired to do better, because I CHOSE to. If someone sets an unrealistic or unfair goal, I’m much less likely to exceed the goal, because I get too wrapped up in the unfairness of the goal. I like to improve and do things in the best way possible. Give me something realistic and I’ll outperform your highest expectation twice over. I love it when goals fall in line with things that I love. Then they aren’t goals, instead they are passions. Last year I blogged, on average, once per month. Twice per month should be doable. You’ll get to see more blog posts on this site. Look out! Ugh. This one IS a goal. I hate finances. I don’t like thinking about money. Money is at such an incredibly low priority for me. I really don’t want to bother thinking about it. I know how to live my life within good means. But it would be good for me to take a closer look at what I’m doing. Financial: When use mint.com every month, also tithe at the same time. This is just my personal preference. Some people like to do automatic tithing. I personally like to do the tithing consciously on a regular basis. Big disclaimer: I don’t want to claim that I’ve been good at tithing the past year. I haven’t. I love to tithe, so I don’t know what my deal is. But being in mint.com will help me to tithe more on a regular basis. These are all things I want to do. Not because I’m going to gain credits for them, but because I just simply am interested in doing them. If you have any goals to share, please feel free to do so in the comments or on your favorite social media channel. This blog post appears on Twitter, Google Plus, Tumblr, Flickr, and Pinterest. Or if you have any thoughts on my goals, I’d love to hear them. Thank you.